This visually rich book provides a satisfying history of the City of Surrey, the fastest growing in Metro Vancouver, with B.C.’s second largest civic population of about half a million people. For a project to mark Canada’s 150th birthday, K. Jane Watt has devoted her passion for B.C.’s past to provide a concise text accompanied by more than 500 photographs, documents, maps and other fascinating illustrations. Obviously delivering an historical overview of sprawling Surrey is a daunting task, considering its vast mix of urban and rural landscape framed by the Fraser River to the north and the Strait of Georgia (Boundary Bay) to the south, including six town centres in between — Whalley, Guildford, Fleetwood, Newton, Cloverdale, and South Surrey. Jane Watt provides useful decade-by-decade chapters from the 1850s to the 1980s. 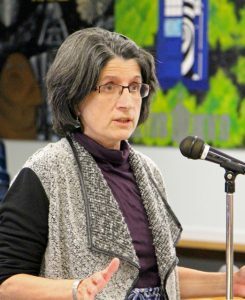 Prefacing immigrant stories of growth and “progress” are two additional chapters: “A Known Land,” describing generations of habitation by the Kwantlen, Semiahmoo, and Katzie First Nations people; and “An Unknown Land,” concerning the arrival of Spanish and English explorers in the late 1700s. 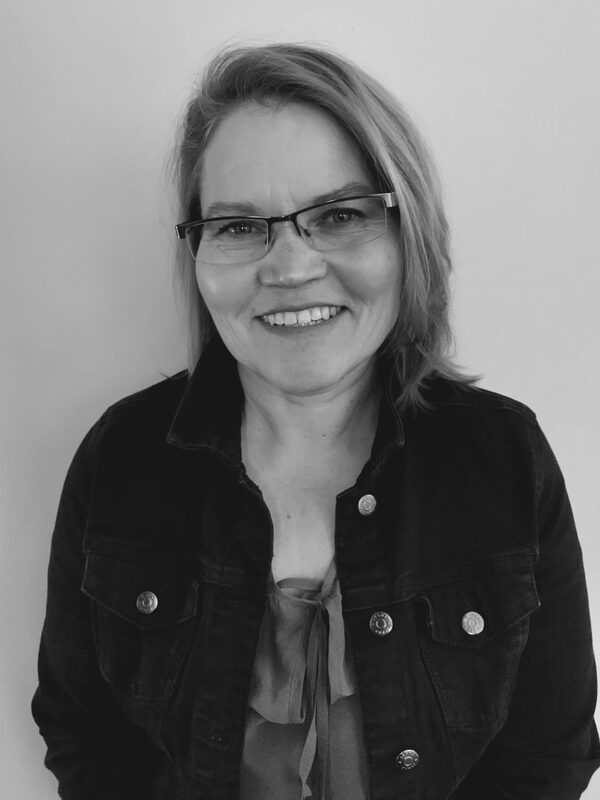 Archaeological findings, oral histories, and cultural practices of the Indigenous people show a continued occupancy of what is now Surrey for at least 4,000 years. Excavations at the Glenrose Cannery site, on the Fraser River near the modern Alex Fraser Bridge, revealed that Indigenous habitation began some 8,000 years ago. I commend Watt for threading Indigenous stories through Surrey’s ensuing colonial and immigrant history. Employees of the Hudson’s Bay Company crossed Surrey from Boundary Bay to Fort Langley in 1824, and as the Fraser River gold rush opened up the B.C. mainland, the Royal Engineers camped at Semiahmoo Bay in 1858 before slashing a trail eastward. 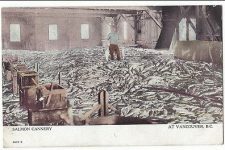 Inside a Fraser River Cannery, 1890s. By the 1860s, English immigrants such as Ebenezer Brown, William and Susan Johnston, James Kennedy, and Samuel Hardy had settled alongside First Nations people on the fertile farmland of the Fraser River delta. Telegraph lines through Surrey in 1865 employed British, Chinese, and First Nations work crews, as a photograph attests, and in this decade the colonial government established First Nations land reserves. In the 1870s, the first mayor of Surrey, Thomas Shannon, was elected. Watt notes that his wife Mary Jane, a teacher and writer, had aboriginal ancestry. More immigrant women began populating Surrey’s farming and logging communities, and by 1880 the settler population consisted of about 200 people. “You knew everyone,” Jack Bothwell recalled of those early days. A steam ferry system developed on the Fraser River in the 1880s, with Brownsville as a thriving hub. By 1892, the lower Fraser had sixteen salmon canneries, another source of employment for Surrey residents. When the great fire of 1898 burned buildings along New Westminster’s main street, residents on the Surrey side of the Fraser River gained a panoramic view — and also felt the economic impact of the temporary loss of a major market. 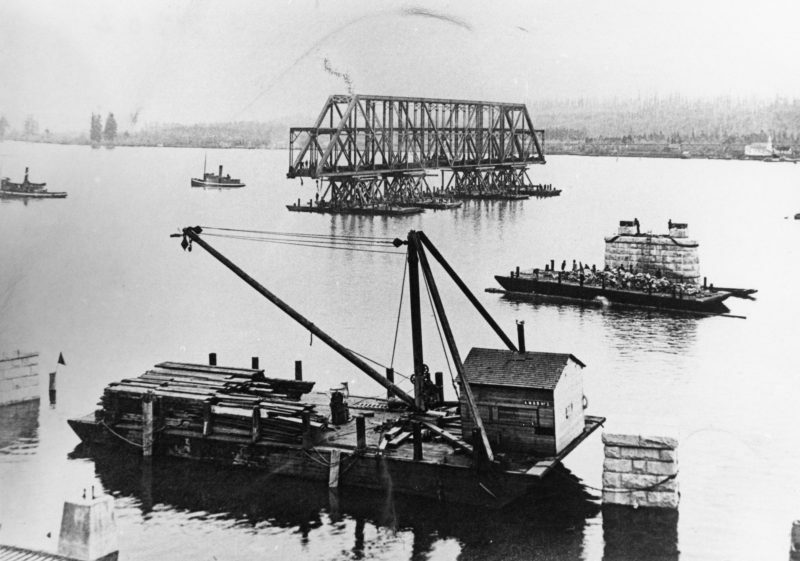 Assembling the rail bridge between Surrey and New Westminster, 1903. In 1904, residents celebrated the first bridge over the Fraser River to New Westminster. “It was a wonder of the age,” James Sullivan recalled, one of many Surrey residents, past and present, to provide brief quotes throughout the book. Phoebe McInnes, a teacher, wrote about her many bicycling trips in her journal in 1900. She crossed the border into Blaine, Washington from her home at what is today 200 Street and 32nd Avenue in less than an hour. Streetlights, stop signs, “volume delay,” and border security would make such a feat impossible today. The sandy beaches of White Rock became a tourist destination. Settlement of immigrants from the Punjab region of India — now comprising a fifth of Surrey’s population — also date back to the turn of the century, as a 1906 photograph shows. The BC Electric Railway linked Surrey to other municipalities in 1910, and by the First World War, co-operatives became popular — including the Fraser Valley Milk Producers’ Association, which still exists. Tom Sullivan, Reeve of Surrey from 1910-1920, proved to be Surrey’s longest serving elected leader. There were still only about 5,000 settlers in 1921, with berry, vegetable, hay, dairy, poultry, and mink farms providing employment. 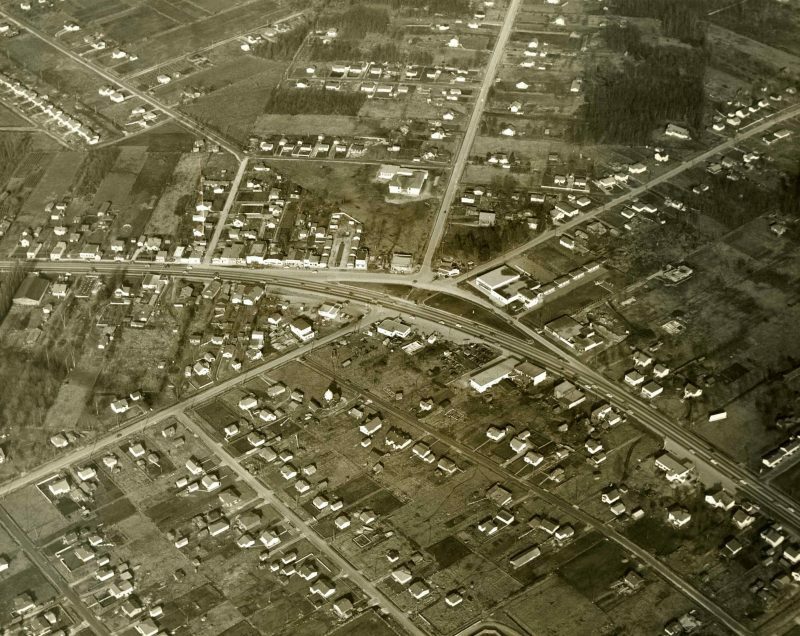 Cloverdale was the municipal hub. Whalley’s Corner Home Gas provided a landmark and gathering place, with a general store and camping grounds, and library book vans travelled to far-flung areas in the 1930s. The Pattullo toll bridge overshadowed the Westminster Bridge (now a train bridge) when it was built in 1937. The 25-cent toll was lifted 15 years later. 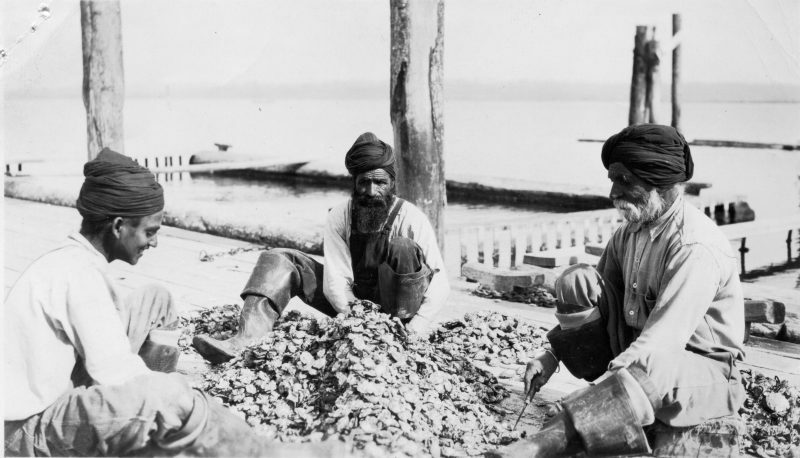 Swaren Singh Prahim Singh and Oudham Singh sorting oysters for the Crescent Oyster Company, 1930s. Delta Archives. It seems remarkable to learn that Surrey High School was the only secondary school in the municipality up to 1940, but ready employment provided an alternative to the senior grades. Still very much “British,” the new king’s coronation was commemorated with the opening of the King George Highway (now Boulevard) in 1940; many “coronation trees” planted alongside the highway are still standing. When the Second World War spread to the Pacific region and led to the internment of Japanese-Canadians, many Japanese families from Surrey’s “Strawberry Hill” were interned in the B.C. Interior. A Surrey peat factory provided materials for wartime ammunition and, as with the First World War, a significant number of residents served in the military and contributed to the war effort. The post-war years saw a real estate boom. Again, it is remarkable to realize that Surrey’s first hospital was established in White Rock as late as 1954. Prior to this, doctors made house calls or residents requiring medical assistance travelled elsewhere. The rural to urban shift, and suburbanization, sped up with the completion of the Trans-Canada Highway in 1962 and the building of the Port Mann Bridge two years later. Impressively, in this decade the Fraser Surrey Docks became the largest multi-purpose marine facility on the west coast. One-third of Surrey’s land is used for farming today, as designated by the Agriculture Land Reserve, set up by the B.C. government in 1973. Watt concludes her narrative in the 1980s with the establishment of Kwantlen College (1981) and the demise of independent shopkeepers due to big box stores. In the Afterward, Watt reveals that Surrey became a city in 1993, that English continues to be the first language of just over half of all residents, and that an annual Fusion Festival celebrates the city’s notable racial diversity. 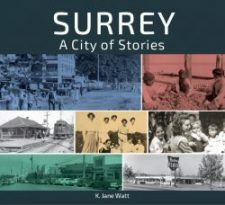 In Surrey: A City of Stories, Jane Watt has provided a well-researched, engaging, and inclusive historical overview of this fast-growing city – and a worthy and welcome addition to B.C. bookshelves. 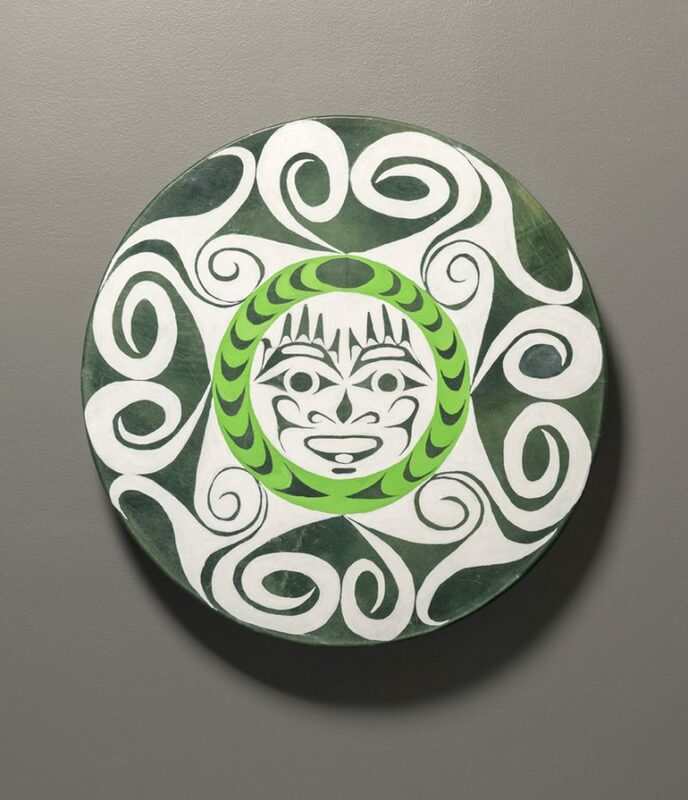 Springtime of Murky Water drum by Kwantlen artists Brandon Gabriel and Melinda Bige. Chuck Bailey Recreation Centre. Scott Massey photo.